Cardiff City boss Malky Mackay has said a win over Derby County would be a fitting tribute to former Bluebirds manager Eddie May. May, Cardiff manager between 1991 and 1994, has died at the age of 68. The Cardiff players will wear black armbands against Derby on Tuesday before an official tribute prior to the match against Leeds on Saturday. "It will be a nice fond memory that everybody turns up and [we] try and win the game in his name," said Mackay. "It would be a fitting tribute I think and something his family would appreciate." A former Wrexham and Swansea defender, May was manager when Cardiff won the Third Division title and Welsh Cup in 1993. He was also at the helm when Cardiff famously beat Manchester City 1-0 in an FA Cup fourth-round tie at Ninian Park in 1994. "He was someone that our support warmed to greatly in his time at the club," added Mackay. "I didn't know him personally. Obviously I know his history here. As far as I'm aware they chanted his name an awful lot during games, so you're doing something right. "Everyone at the club passes on our condolences to his family." Cardiff City maintained their Championship play-off push with a hard fought 1-0 victory at Barnsley. The Bluebirds are two points ahead of seventh-placed Middlesbrough and Mackay is pleased with his side's current position ahead of the Derby match. 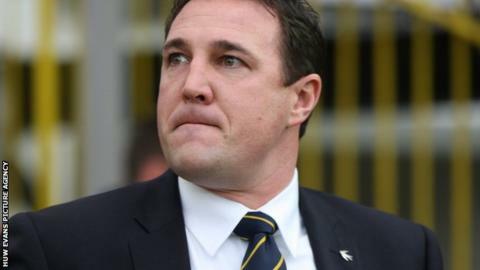 "The fact we're in the play-offs with three games to go is pleasing considering the way the season's gone for a lot of different reasons," said Mackay. "You've got to be up for the competition, be up for the battle but stay calm enough [so] that this time of the season we can perform to a consistent level. "Derby are a good team," said Mackay. "They're a team that have hurt plenty of teams this season and at time have been right up there. "There's very little between teams in this league and Derby are a team like that. We've got a tough game ahead of us on Tuesday night."